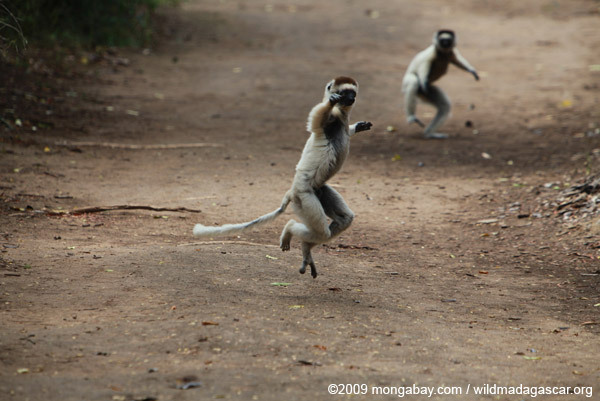 Verreaux’s Sifaka (Propithecus verreauxi), listed as Vulnerable, in a heated chase. Photo by: Rhett A. Butler. Due to the wonderful idiosyncrasies of evolution, there is one country on Earth that houses 20 percent of the world’s primates. More astounding still, every single one of these primates—an entire distinct family in fact—are found no-where else. The country is, of course, Madagascar and the primates in question are, of course, lemurs. But the far-flung island of Madagascar, once a safe haven for wild evolutionary experiments, has become an ecological nightmare. Overpopulation, deep poverty, political instability, slash-and-burn agriculture, illegal logging for lucrative woods, and a booming bushmeat trade has placed 94 percent of the world’s lemurs under threat of extinction, making this the most imperiled mammal group on the planet. In order to stem a rapid march toward extinction, conservationists today publicized an emergency three year plan to safeguard 30 important lemur forests in the journal Science. 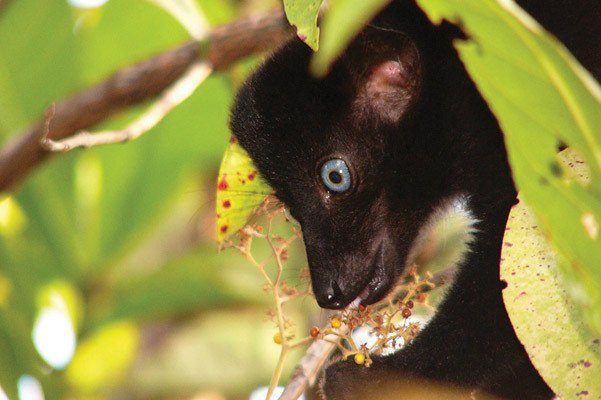 A male blue-eyed black lemur (Eulemur flavifrons), listed as Critically Endangered, in Sahamalaza–Iles Radama National Park. Photo by: of Nora Schwitzer. Conservationists say that the current environmental crisis in Madagascar is of international importance, not least because this is the only place on Earth that houses an entire family of primates, found no-where else. Moreover, lemurs play vital roles in the health and biodiversity of Madagascar’s remaining forests through dispersing seeds and pollination. They represent classic keystone species on the island. Although lesser-known than megafauna like tigers and elephants, lemurs international profile has risen in recent years due to wildlife documentaries, popular animated films, and new discoveries. “Madagascar—and the world—will undoubtedly be much poorer without them,” said Schwitzer. 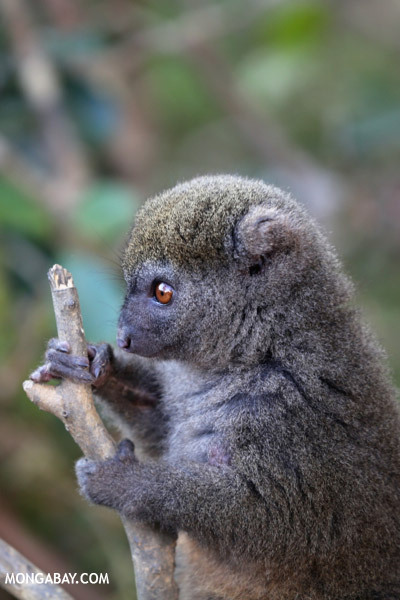 The Ankarana sportive lemur (Lepilemur ankaranensis) is listed as Endangered. Photo by: Rhett A. Butler. Despite being regulated to a single island, lemurs are a big family. By the early 1990s, scientists had identified around 50 species of lemur. But as taxonomists turned to genetic studies, scientists found that lemur diversity was even higher than expected. Today, 101 species of lemur have been described, many locked into small forest fragments under siege by the dominant primate on the island: Homo sapiens. 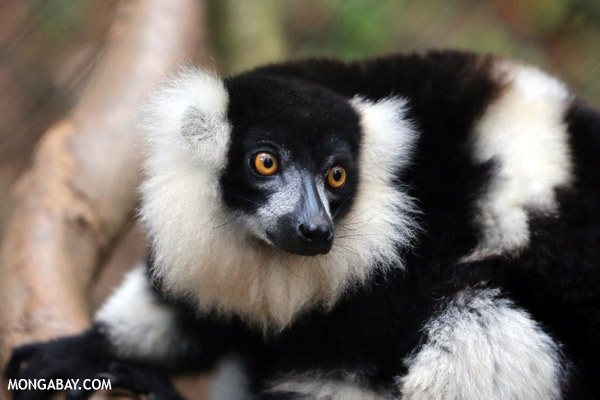 As more species were uncovered—and forests continued to fall for agriculture and fuel—the percentage of lemurs threatened with extinction also skyrocketed. While at least 17 lemurs have gone extinct since humans arrived on the island, none have vanished in the last few hundred years. However the situation worsened when Madagascar suffered a political coup in 2009, throwing the country into chaos: foreign aid fled, forests (already under pressure) were fragmented, and locals increasingly turned to hunting lemurs for protein, a practice little known until this decade. But the political coup, and resulting instability, only exacerbated issues that have long been present in the country. The most important is deforestation. Indeed, Madagascar is one of the poorest country’s on Earth, with more than 90 percent of the population surviving on less than $2 a day and about 50 percent of children under five suffering from malnutrition. This extreme poverty, combined with political instability and cultural shifts, have led to lemur poaching at “unprecedented scales, even inside protected areas,” noted Schwitzer. The poaching has even gone commercial with grilled lemur served as snacks in some restaurants and bars. Given these country-wide problems, it’s no wonder that the entire lemur family is imperiled. 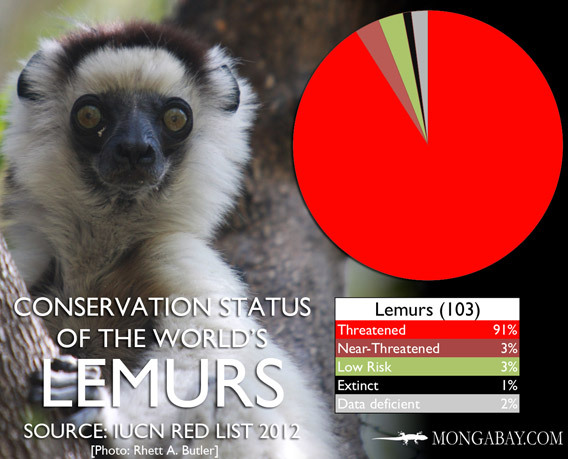 But the scale is still hard to fathom: 22 lemur species are currently listed as Critically Endangered by the IUCN Red List, another 48 are considered Endangered. 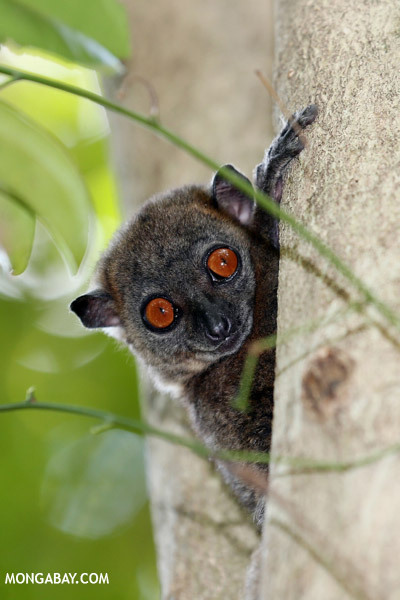 Some species at the very edge: the northern sportive lemur northern (Lepilemur septentrionalis) is down to less than 20 individuals in the wild. In addition to all the threats they face, a simple lack of awareness in the general public has been crippling, according to Dolch. Lemur champions aren’t ready to give up. 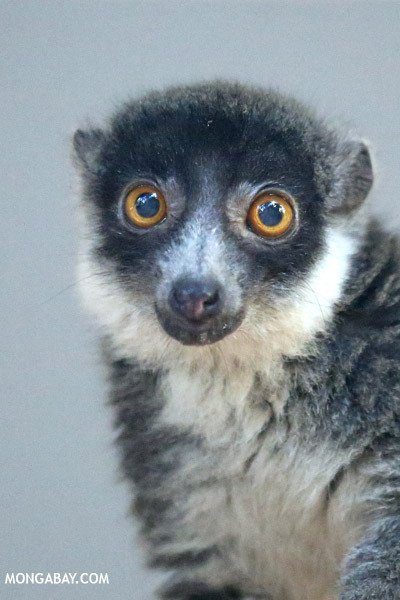 Amidst such staggering statistics, they say there are still positive trends and lemurs could be brought back from extinction, but only if the government, donors, and conservationists take immediate action. Arguably the most positive recent trend in Madagascar is that even in the midst of a government coup, ongoing instability, and deepening poverty, tourists kept flocking to see the country’s famed biological treasures. “Tourism has held up as one of the country’s biggest foreign exchange earners,” Schwitzer said. In addition, Madagascar is home to a number of well-established biological research stations and has several notable scientists and conservationists working in the country. Also, the political situation may finally be taking a turn for the better: last December, democratic elections brought about the election of former finance minister, Hery Rajaonarimampianina. “There are encouraging signs that the new president will set the conditions for a return to effective governance and resumption of international aid,” the scientists write. The President of Conservation International and co-author of the paper, Russell Mittermeier, says talks with Rajaonarimampianina have already proven fruitful. To this end, Schwitzer and his colleagues have put together a 3-year action plan from 2013-2016 in a bid to staunch the decline in lemur numbers. The conservationists started by selecting where resources were needed the most. 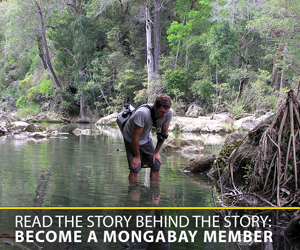 One of the most important initiatives, according to the researchers, is creating new community-managed protected areas. “This means empowering local communities, whose livelihoods depend on these natural systems, to manage new protected areas with the goal of preserving biodiversity and maintaining ecosystem services (such as providing medicinal plants, clean drinking water, and other benefits from intact forests),” explained Johnson. 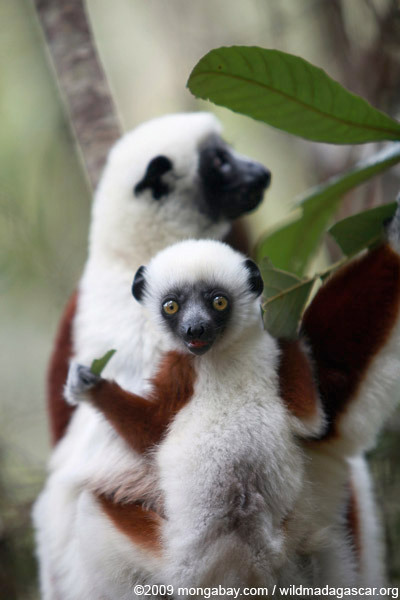 Female Coquerel’s Sifaka (Propithecus coquereli) with baby. This species is listed as Endangered. Photo by: Rhett A. Butler. But how much will all this cost? Individual site plans range from $500,000 to $50,000 with a total price tag of around $7.6 million. The authors call this a “reasonable amount in terms of international aid, for an incalculable return.” Indeed, the cost is nearly 40 times less what was raised for tigers during an international summit in 2010. The scientists argued that if implemented such a plan could prevent the extinction of any lemur species over the next decade, and build a base for longterm conservation success. 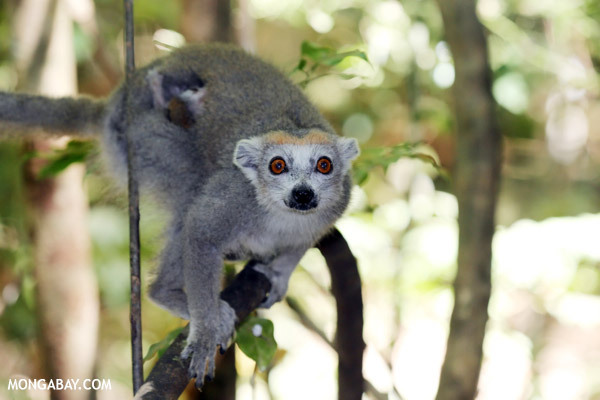 But the scientists say that it’s not just big donors, NGOs, and governments that can help Madagascar keep lemurs safe. 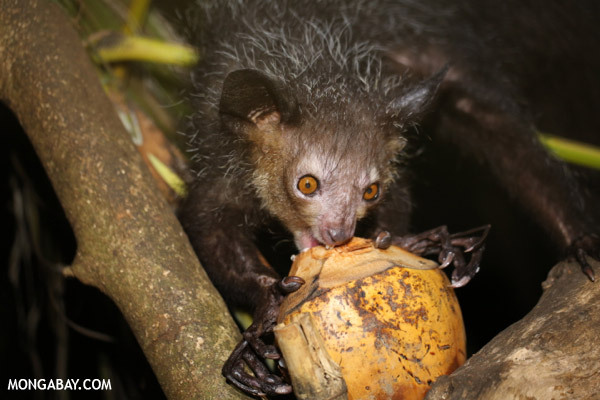 The aye-aye (Daubentonia madagascariensis), listed as Near Threatened, feeding on a coconut. Photo by: Rhett A. Butler. Female crowned lemur (Eulemur coronatus), listed as Vulnerable. Photo by: Rhett A. Butler. Black-and-white ruffed lemur (Varecia variegata), currently listed as Critically Endangered. Photo by: Rhett A. Butler. (08/09/2013) Does size matter? When referring to primate brain size and its relation to social intelligence, scientists at Duke University do not think the answer is a simple yes or no. In the past, scientists have correlated large brain size to large group size. However, in a new study published in PLoS ONE, scientists at Duke University provide evidence that large social networks, rather than large brains, contribute to social cognition, favoring the evolution of social intelligence. 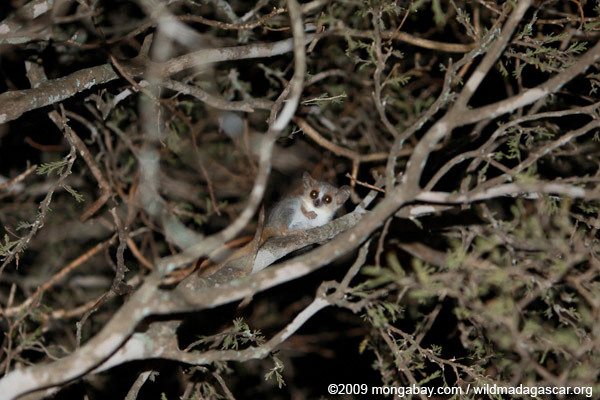 (07/30/2013) Researchers have discovered a new — and critically endangered — species of lemur on the island of Madagascar. The primate is formally described in the journal Molecular Phylogenetics and Evolution.